Visitors to the Perth Zoo these school holidays will be able to make wild Easter gifts for the Zoo’s remarkable animals. To get into the Easter spirit, Zoo goers can turn their creative hand to help make environmentally friendly papier-mâché Easter eggs on the Main Lawn for the 1300 critters that call Perth Zoo home. But these are no normal crafty eggs. Perth Zoo is a sustainable conservation organisation and committed to reducing their environmental footprint. Unlike traditional papier-mâché creations, they will be made without balloons inside and made from recycled materials. 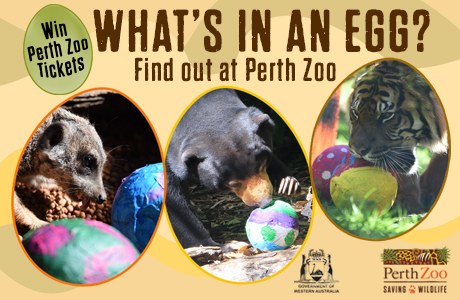 The eggcellent creations will be provided to the animals, where visitors can watch them enjoy their own wild animal Easter egg hunt as part of the Zoo’s regular animal enrichment program. We are giving B2Me members the chance to WIN a family pass to visit Perth Zoo! Competition closes at 9am on Tuesday 23 April, 2019.